Tiny wavelets on the way to Rome last night. Finally… a good night’s sleep? Not for me. It seemed endless, as I woke up a dozen times to peak at the clock. This was the first time we had to be somewhere early in the morning and even though I set an alarm and arranged for a wake up call… I kept imagining that both safeguards would fail and we would miss our bus to Rome; taillights mocking us as they receded from view. My mom calls it “trip jitters”. I call it neurosis. Steve slept like a deadman. We were quite surprised to find a hand written note from the Pope under our stateroom door this morning inviting us to tea at the Vatican. Apparently, he feels that our Catholic friends back home are in need of serious attention and requested a joint prayer session. We assumed the note was delivered to the wrong room, since all of you are either perfect little angels or beyond any help we could offer. We decided to hang out with the pagans in ancient Rome instead. The port (Civitavecchia) is about an hour’s drive from Rome. Deep green hills full of grazing sheep and sleeping vineyards held our attention along the way. It was a stunning day with a deep blue cloudless sky, no wind, and warmth. We were dropped off at the Piazza del Popolo (People’s Plaza) with 7 hours to explore. 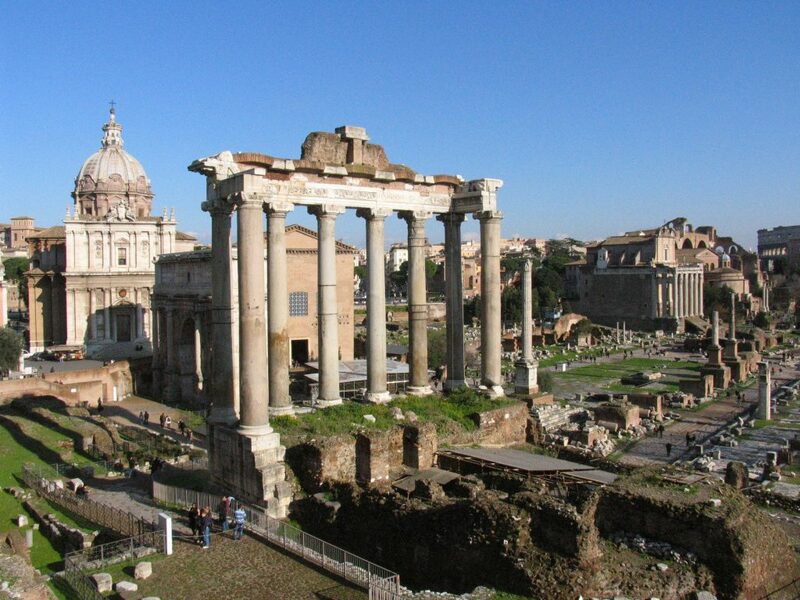 It was Saturday and the city was buzzing with Romans living life. Coffee flowing in outdoor cafes, treasure filled shopping bags ready to burst, groups of old men gesticulating wildly to get their point across, and a cigarette in almost every hand. Hello? Smoking Kills! Our first stop was the Piazza di Spagna (Spanish Steps), where we were greeted with The Rules posted in Italian and English. Aren’t translations fun? For centuries, important citizens and visitors congregated at the Steps. Artists scoured the area in search of models. People were (and still are) hoping to be discovered. 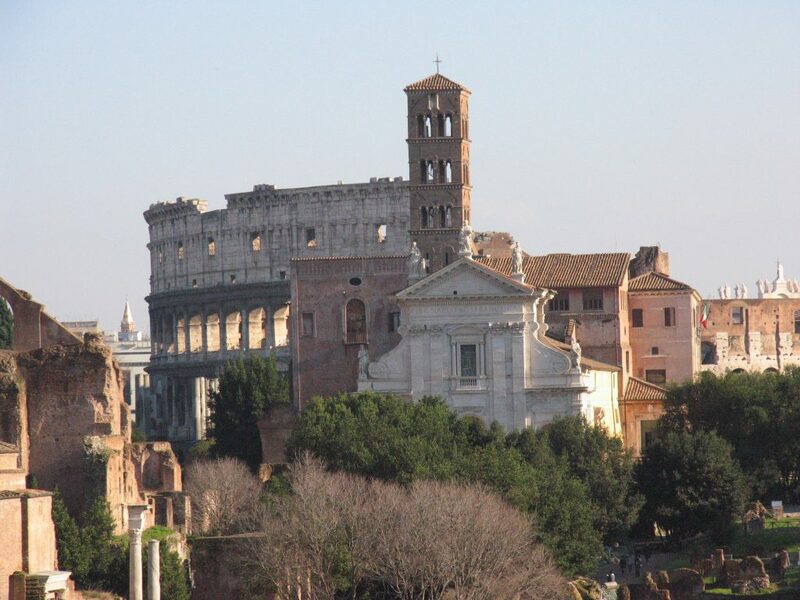 The site is no less popular in contemporary Rome, but the refinement has faded (one look at The Rules will tell you that). Next we headed to the Trevi Fountain. It is said, that if you casually toss a coin over your left shoulder into the fountain, it will ensure a return visit. A second coin will grant you a wish. The guy who scrubs the bottom is among the richest in the city. I’m sure he reports all the cash income too. Just like his father, who started the Legend. Our next stop was the Pantheon; completed in 27 BC and still completely whole. It started life as a Pagan place of worship and was later consecrated as a Catholic Church. The huge round open hole in the roof is the only light source. The massive columns (40 feet high and 6 feet in diameter) came from Egypt. Then it was off to find lunch. We wanted a place where the menus had no translations and the owner was stereotypically Italian. We found it. There was a large middle aged woman sitting behind a cash register and stroking a cat who was lying ON the menus. She pried them from under his generous rump, and led us to a beat up wooden table with ornate chairs. We were plodding through the unfamiliar words when she returned with unappealing white bread. I took a bite out of curiosity – before I remembered that in Europe – nothing that gets delivered to the table is free. You have to ask for it to be removed pronto – or you pay for it – even if you don’t touch it. We spent 4 Euros ($5.00 US) for bread that should have been tossed three weeks ago. Stupid tourists. The pasta was fantastic though. I had Rigatoni Carbonara that was thickly coated with tangy cheese and salty ham. Steve had a squiggly pasta smothered in mushrooms, ham, and something we could not quite identify. The cat kept us company by weaving through our legs and depositing long hairs on our jeans. He even jumped on the table to take a closer look at our meals. We wanted an authentic experience, we got it. After lunch we headed to the Coliseum, completed in 80 AD and the most celebrated of all Roman monuments. Up to 50,000 spectators crowded in for horrifying “entertainment” as live (unarmed) men confronted lions (or each other). Violence was a drug in this depraved society. With a bit of imagination, we can make the parallel to 21st century spectator sports and video games, can’t we? Our last stop was the ancient remnants of the Roman Forum before heading back to our pick up point. Today we continued on our Southeasterly course towards the Suez Canal and Egypt. Predawn, we passed the volcanic island of Stromboli and witnessed 2 eruptions in 30 minutes. Lava was vomited over 300 feet high! Despite this “Old Faithful” pattern, there is a tiny village of fisherman who cling to the nearly nonexistent coast line behind the crater. Soon after, we passed through the Straights of Messina between the “toe” of Italy’s boat and the Island of Sicily. It was clear enough to see Mt. Etna. A dormant volcano in Sicily over 10,000 feet high and covered in snow. It is a rare sight as the mountain is usually shrouded in mist. Our only land sighting today was the Island of Crete. Greek owned, and believed to be Plato’s fabled Lost City of Atlantis. We will start our transit of the Suez Canal around 4 AM tomorrow.